Christ's seven last words from the cross have long been a source of reflection, challenge, and soul-searching. These simple statements contain the full range of human emotions and divine self-revelation: grief, compassion, despair, forgiveness, physical need, the promise of redemption. In many ways they embody the core of the gospel. In this brief book one of today's most noted churchpersons and preachers confronts the reader with the seven last words's claim on her or his life. Written with the clarity, depth, and insight that are Will Willimon's trademark, this book offers afresh the challenge and grace of the message of the Crucified One. Thank God It's Friday by William Willimon was published by Abingdon Press in November 2006 and is our 51088th best seller. The ISBN for Thank God It's Friday is 9780687464906. 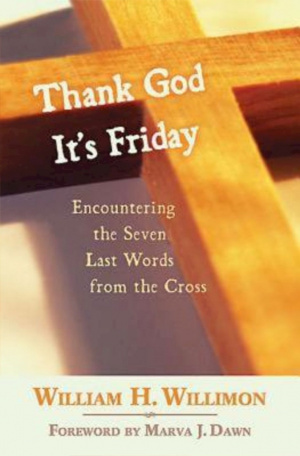 Subtitled Encountering the Seven Last Words from the Cross, this book by the American Methodist bishop William Willimon, is a close examination of the meaning of the last words spoken by Jesus while he hung on the cross on Good Friday. In his analysis of what exactly these words signify for us today he gives a startlingly new slant to the familiar phrases. It is a book for every Christian who wants to understand better the terrible events of Good Friday and come to terms with its horror and its glory. In uncompromising language and unsentimental images he forces us to look closely at the cross, at the suffering of Jesus and at the suffering and pain of our own human condition. At the same time he looks forward to the joy and triumph of the resurrection. This is a collection of sermons that are challenging, disturbing and always illuminating. Got a question? No problem! Just click here to ask us about Thank God It's Friday.